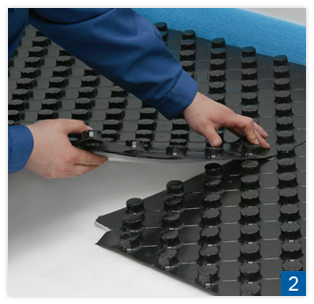 KAN-therm Profil is a complete system designed for building heating and cooling underfloor installations. 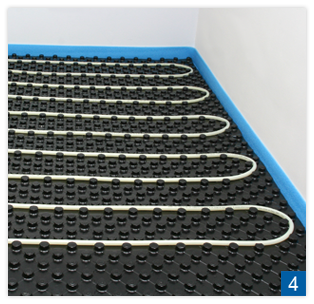 For a KAN-therm Profil floor heating pipes are pressed into the upper part of a styrofoam plate provided with a special profile and covered in a plastic layer. 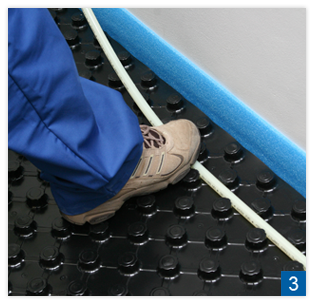 This is a wet method of laying a heating system. With 11 mm thick styrofoam plates the KAN-therm Profil System can be applied also for a wall heating. installation boxes: surface mounted, concealed or for cladding with glazed tiles. 1. The first step is to lay the wall along construction partitions of a room. 2. Next we lay the styrofoam with foil so that it overlaps on the adjacent styrofoam sheets. 3. The next step is laying pipes by pressing them into a profiled upper part of the Profil plates. 4. This method of fastening pipes is fast and sure and pipes are laid according to a designed spacing. 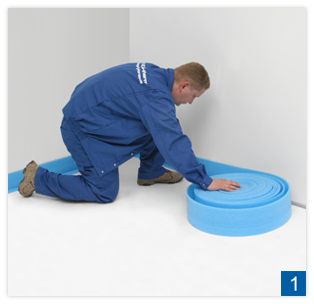 After laying pipes, connecting them to a distributor and after pressure-testing them you can start pouring a floor with concrete with the addition of the BETOKAN or BETOKAN Plus plasticizer (depending on the required floor thickness).